enqan hesht er, vor djvar te copy paste anox lini es ejum. 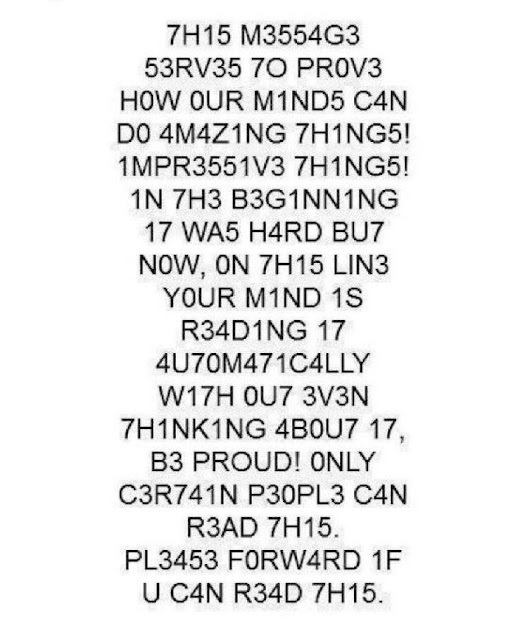 This message serves to prove how our minds can amazing things! Impressive things! In the beginning it was hard, but now, on this line your mind is reading it automatially without even thinking about it, be proud! Only certain people can read this. Please forward if you can read this. Im mot el stacvec. Shat hetaqrqir ban er. I am a genius. 94ННОЗ С006ЩЗНNЗ П0К4ЗЫ8437, К4КNЗ У9N8N73ЛЬНЫ3 83ЩN М0Ж37 93Л47Ь Н4Ш Р4ЗУМ! 8П3Ч47ЛЯЮЩN3 83ЩN! СН4Ч4Л4 Э70 6ЫЛ0 7РУ9Н0, Н0 С3ЙЧ4С Н4 Э70Й С7Р0К3 84Ш Р43УМ ЧN7437 Э70 4870М47NЧ3СКN, Н3 349УМЫ84ЯСЬ 06 Э70М. ЛNШЬ 0ПР393Л3ННЫ3 ЛЮ9N М0ГУ7 ПР0ЧN747Ь Э70.